If built, the 230-storey, 1,152m tall “Bride Tower” would be located in Basra and would be made up of four buildings joined together. An alien planted in the city, disconnected from the urban scale at ground level. “The Bride, on the other hand, will be conceived as a city itself both vertically but also horizontally from the ground. The tallest building under construction is the 1km-high Kingdom Tower in Jeddah, Saudi Arabia. However there is no fixed location for the building, and although Basra is relatively peaceful and prosperous, neither a construction schedule nor a price has been suggested. The tallest building completed is the 830m Burj Khalifa in Dubai. The government of Saudi Arabia has suspended construction giant Saudi Binladin Group from working on new contracts following Friday’s crane collapse at Mecca’s Grand Mosque which killed 107 people. 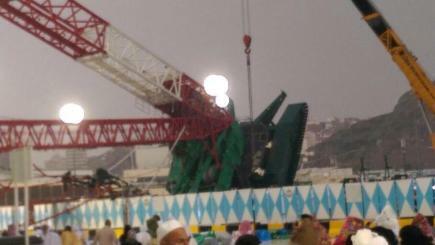 The crane toppled over at Mecca’s Grand Mosque last Friday, less than two weeks before Islam’s annual hajj pilgrimage. The company, one of the largest contracting companies in the kingdom, had been carrying expansion work at the Grand Mosque. An official statement referred without elaborating to the responsibility and “shortcomings” of the company following an investigation into the crane crash that also injured 238 other people. The company is believed to have attributed the collapse to a lightning strike breaking a cable that was used to secure the crane. At least 107 people have died after a construction crane crashed into the Grand Mosque in the Saudi city of Mecca after toppling over during a storm. The mosque is Islam’s holiest site, and the tragedy occurred ahead of the start of the annual hajj pilgrimage later this month. The mosque is Islam’s holiest site to which Muslims face in daily prayers and a forms central site among the hajj rituals. Images aired on Saudi state television showed the crane’s metal boom had smashed through what appeared to be the roof of the mosque. Mr Al-Mansouri said the crane, which was being used in construction work at the mosque, struck a circular area around the Kaaba and a nearby walkway.